When I started thinking about the card game for my husband’s birthday, I knew I’d wanted to make a special box for it. For one, because both of us love beautiful boxes (something in our gene pools) but most importantly because we display our board games in our living room. And if it is displayed, I want it to look good among our other games. 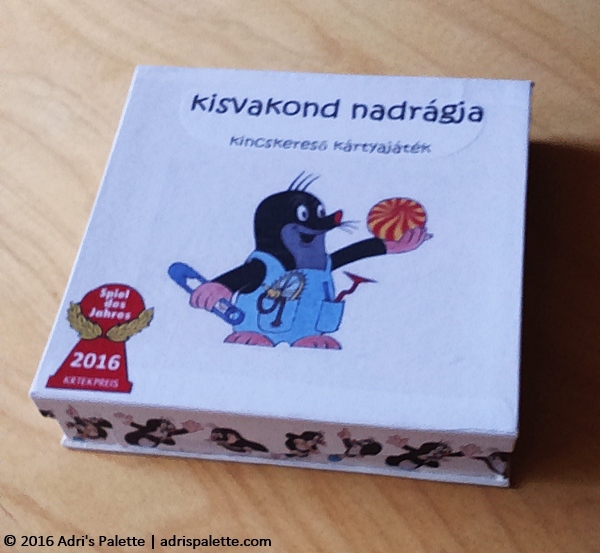 So with that in mind I started thinking and decided to decoupage a box in the theme of the game itself, Zdeněk Miler‘s Krtek, The Little Mole. I tried decoupage earlier and I really liked it. I loved the idea of decorating a box, a shape with paper cut-outs. Making it unique. One thing I did not like about it though is the endless process of gluing, letting it dry, then varnishing and letting it dry, then reapplying the varnish… you get the gist. Added layers meant more time, more hassle and more sticky fingers. Until now! 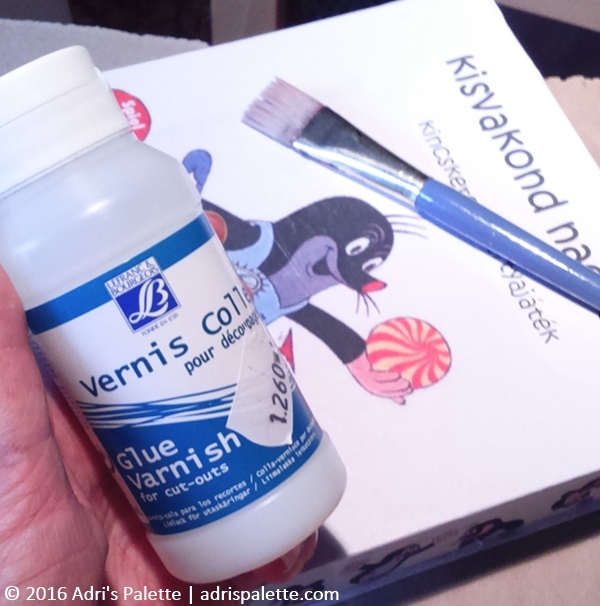 I discovered a hybrid, glue and varnish all in one. As you are gluing on the cut-out you just stroke an additional layer over it as varnish. Voila! One drying session and you are done. Genius! Both the paper mache box with its magnetic closure and the little mole posters (from which I did the cut-outs) were from my local crafts store. I also decided to spice up the box with a play on images that you’d usually find on real board game boxes. Like the age warning or the Spiel des Jahres award sticker, which instead of the proper Kritikerpreis (critic’s award) features Krtekpreis, or The Little Mole’s Prize. The hilarity this caused was heard well beyond our walls. So here is the finished card game. Playing and reference cards, rules, a couple of mole hills and some clothespins that act as prizes in the The Little Mole’s Trousers – Treasure Seeker Card Game. (Phew, that was a mouthful!) When I gave the game to my husband he thought it is something I bought in a shop. Only slowly did it sink in that I made it for him. Since then we have played it many times. I can happily report that he loves it! We love discovering the mechanics and coming up with strategies to outsmart the other. Sometimes we succeed, other times it becomes a lessons learned. But what I love about him is how he tries to help me rethink, rewrite the rules. Or is he trying to help himself? Whichever way it is, I foresee us playing with it more and more frequently. 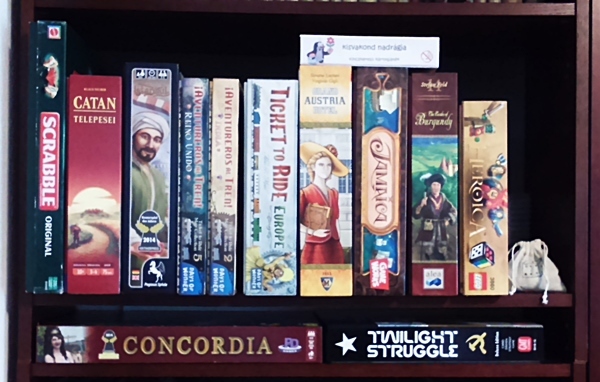 And if I may add, the game looks mighty fine among our other games on our bookshelf.